When Diane of Bibliophile By The Sea wrote a Tuesday introduction about The Days of Abandonment, I had to read it for myself. I have a morbid fascination, I guess, with the whole issue of abandonment. I’ll spare you the grittier details, but suffice it to say how well I remember the days when I was first alone…the weekends which would stretch forever, particularly Sunday whose hours I could never fill. Elena Ferrante, an Italian writer, relates such an experience with the raw fervor one might expect from the Italians. This is a story from the gut of one woman’s experience through being abandoned by her husband. It tells, very intensely, how she copes with the apartment, the dog, her children, her own emotions as she begins to balance her life anew. Without him. I arrived at the Farracos’ too early. The tried to entertain me and I forced myself to be cordial. at a certain point I glanced at the set table, mechanically I counted the places, the chairs. There were six. I stiffened: two couples, then me, then a sixth person. I understood that Lea had decided to look after me, she had planned a meeting that might lead to an adventure, a temporary relationship, a permanent arrangement, who knows. Confirmation of this came when the Torreris arrived, a couple I had met at a dinner the year before in the role of Mario’s wife, and the vet, Dr. Morelli, whom I had asked about Otto’s (her dog’s) death. Morelli, who was a good friend of Lea’s husband, congenial, up to date on the gossip of the Polytechnic, had clearly been invited to keep me amused. The whole thing depressed me. This is what awaits me, I thought. Evenings like this. Appearing at the house of strangers, marked as a woman waiting to remake her life. At the mercy of other women who, unhappily married, struggle to propose to me men they consider fascinating. Having to accept the game, not to be able to confess that those men arouse only uneasiness in me, for their explicit goal, known to all present, is to seek contact with my cold body, to warm themselves by warming me, and then to crush me with their role of born seducers, men alone like me, like me frightened by strangers, worn out by failures and by empty years, separated, divorced, widowers, abandoned, betrayed. You will not read this novel unscathed. If you have been abandoned by someone you once loved, you will relate to the heroine completely. If you have been fortunate enough to escape such treatment, you will have a new sympathy for those who haven’t. It is a profound novel of visceral emotion. i think i need to make this my next europa! ferrante is always really edgy and challenging. This is the first book I've read of hers, but she writes with such gut feeling I can see why you'd call her “edgy and challenging”. Great stuff! So happy to see you enjoyed this one as much as I did…I just order another book by her/him called – Troubling Love from the library. This sounds like an amazing read! I've added two of Ferrante's books to my read-a-thon pile for this weekend. Too bad I don't have The Days of Abandonment. 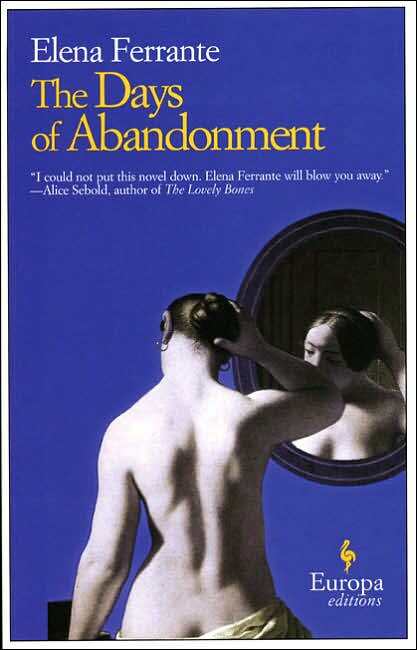 I am tempted to read “THE DAYS OF ABANDONMENT” not being unfamiliar with this subject…I will be looking to buy it. After reading reviews from both Diane and you, I think this is moving up my TBR pile. Sounds fantastic. Thanks for bringing this author to my attention. I've never heard of her! I love the way your review comes about! I did read it on Diane's blog as well. I remember reading Diane's review and thinking that I have to read this. I'm glad you liked it too, I hope to read it next year. This looks *very* interesting. I requested that my library order this book. If they don't, I'll probably order a used book on Amazon.